Grade A… and Humane Too! Apex Predator – Easy Meat may, at first blush, sound like another morbid tough-guy boast of heavy metal superiority. Given that the band behind the release is called Napalm Death, it is easy to imagine a brutally bludgeoning overload of metal mayhem. Well, it is, as Napalm Death are the grindcore pioneers, arguable inventors and definite torch-carriers of the fastest, loudest, and most violent subgenre of rock music to hit the scene in decades. However, those familiar with Napalm Death will naturally anticipate an album full of thoughtful lyrics and righteous anger – and Apex Predator is that too, delivering a collection of protest songs that rail tirelessly (though with some subtlety) against capitalism’s global dominance and its harsh reshaping of life within societies both rich and poor. On the introductory title track (whose first section bears an odd sonic similarity to Captain Beefheart’s “Well”), vocalist Mark “Barney” Greenway chants from the perspective of the broken down and luckless, inviting predators to feast on his easy meat. In this image is the tension that has kept Napalm Death interesting for decades, and keeps them interesting here – the push and pull between their uncompromising sonic assault and the underdog-championing, progressive nature of their lyrics and themes. Purists may point back to 1987’s Scum and say “That’s the master document.” However, none of the current members of Napalm Death played on that album. In fact, only former drummer Mick Harris (no relation to, and not to be confused with current guitarist Mitch Harris) played on both sides of the record; even then Napalm Death was more of an entity than a set of musicians. And let’s face it, by modern standards, Scum sounds pretty silly, with corny metal riffs, flat, hollowly reverberating punk production and goofy, word-slurring grunted vocals. Flawed though it was, Scum still stands as a watershed blueprint, and the current incarnation of Napalm Death has been racing alongside the legions inspired by that founding document to stay on the bleeding edge of grindcore. While Napalm Death haven’t pushed the form in any drastic new directions, they have kept pace, and Apex Predator – Easy Meat is a testament to this fact. The album is delivered loud and tight, perhaps more thrash and death metal than pure grind but still possessing the essential speed and heaviness to keep the jaw clenched and the mosh pit churning. Excepting a few brief diversions into industrial clangor and arena metal, Apex Predator noticeably resembles one particular grindcore release, and that is Pig Destroyer’s Phantom Limb. This is great, as Phantom Limb is a phenomenal record. Both releases contain suffocating intensity, rich mixes, oodles of riffs, and lunatic vocals that belie their humanist verbiage. For example “Smash a Single Digit” jumps out of the gate with urgent, confrontational, snare roll-punctuated grind, giving way to sections of galloping thrash. “Metaphorically Screw You” primarily blasts away (as does the later “Cesspits”), Greenway’s enveloping roars teeming with rage. “How the Years Condemn” shows Napalm Death’s versatility, riding a bouncy, almost alternative rock-ish riff through bassist Shane Embury’s reflective, emotional lyrics. There are more well-constructed songs, each bearing their own engaging moments. Apex Predator’s strength is that it flows well as a cohesive album, while still offering details that leap forth on close listening. The album’s sustained cacophony can be tiring to those not accustomed to grindcore, but the endurance is worth the effort, as the songs gain distinction with each spin. The lyrics come recommended too. Though not as rousingly polemic as a Nasum, or as poetically acute as a Pig Destroyer, the words of Greenway, Embury and Harris still add subtext and depth to the din. 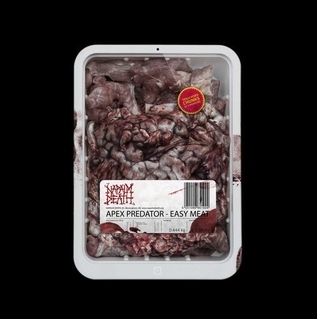 Sonically, Apex Predator – Easy Meat delivers the essential proteins – chunky, textured riffage, fast and full grind passages and huge, intimidating vocals. This is meat worth consuming, even if it takes some effort to chew and digest.